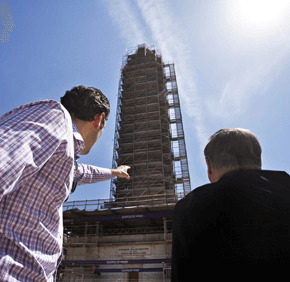 Baltimore Auxiliary Bishop Denis J. Madden toured Baltimore’s Washington Monument May 6 with Tyler Tate, president of Lewis Contractors. Bishop Madden baptized Tate’s daughter Genevieve. The Washington Monument was closed in 2010 to address safety concerns arising from water damage, among other factors, according to the Mount Vernon Place Conservancy. The monument’s restoration, which began last year and is expected to be completed by July 4, 2015 for its bicentennial, includes upgrading the lighting and electrical systems. Lewis Contractors is working to restore the landmark. The monument, which took 14 years to build (1815-29), is the first public monument to honor President George Washington. It stands 178 feet tall and was designed by Robert Mills, who also designed the Washington Monument on the National Mall in Washington, D.C.
A statue of Washington, depicted resigning his commission as commander-in-chief, stands at the top of the monument. To view a slideshow of the monument, navigate the arrows below.